A listless coder discovers inspiration—and some unusual corners of the Bay Area—via a batch of sourdough starter. 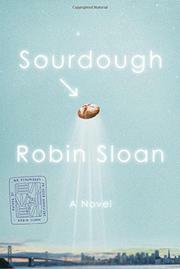 Lois, the narrator of Sloan’s second novel (Mr. Penumbra’s 24-Hour Bookstore, 2012), works at a San Francisco robotics firm, where long hours move her to regularly order in from a sandwich shop. The place is peculiar—it’s delivery-only, and the two brothers who own it are vague about their background (“Mazg,” they say)—but the food is amazing, especially the sourdough bread. When the brothers leave town, they eagerly bestow their sourdough starter on their “number one eater,” and though Lois is hapless in the kitchen, she soon masters baking so well her loaves catch the attention of her employer’s in-house chef and, eventually, an elite invite-only farmers market in Alameda. Early on, the novel reads like a lighthearted redemption-through-baking tale with a few quirks: the starter seems to have moods of its own and the loaves’ crusts crack into facelike visages. But in time the story picks up—and becomes somewhat burdened by—a strenuously oddball supporting cast and various allegorical commentaries about human virtues amid the rush to process and automate everything, including food. (One of Lois’ coding challenges is teaching a robotic arm to crack an egg.) Among the characters are a collector of vintage restaurant menus, members of a club for women named Lois, the Mazg brothers’ forefathers, and a fellow baker who plays Grateful Dead bootlegs to encourage his own starter. Sloan’s comic but smart tone never flags, and Lois is an easy hero to root for, inquisitive and sensitive as she is. But the absurdities of the plot twists (in part involving her starter’s need to acquire a “warrior spirit”) ultimately feel less cleverly offbeat than hokey. “I oscillated between finding this vision totally ridiculous and finding it deadly serious,” Lois bemoans at one point. But the story increasingly leans toward the former.